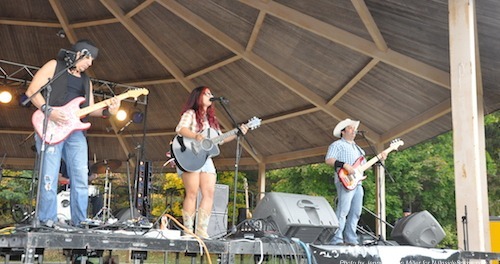 Nikki Briar and the SweetBriar Band at the Newton Country Cool Festival. Photo by Jennifer Jean Miller. 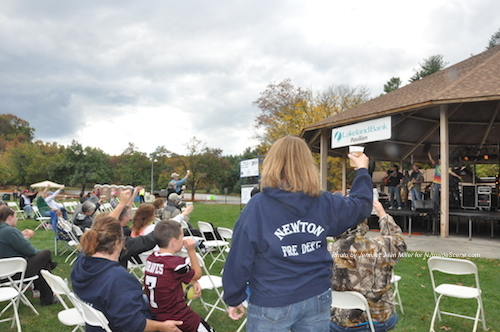 NEWTON, NJ – Locals gathered on Saturday, October 18 to enjoy music, food and fun for a good cause at the first Newton Country Cool Festival at Sussex County Community College. 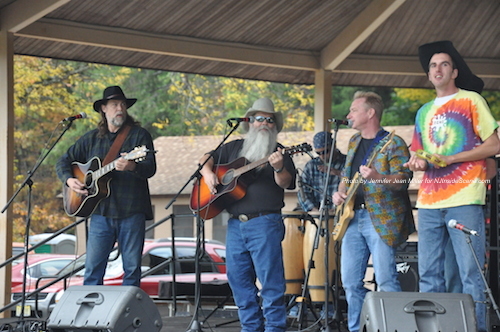 The Newton Country Cool Festival was a special fundraising event presented by the Town of Newton, The Mitchell Agency, and Sussex County Community College. 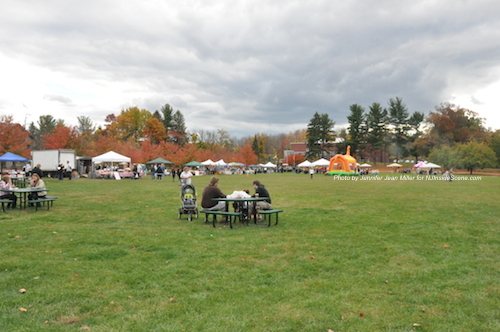 By approximately 2:30 p.m., 300 attendees made their way to the festival. For a $3 cover, guests could enter, with all of the proceeds benefitting the Sussex County Food Pantry and the Newton Fire Museum. Attendees visited the food and vendor booths, and had the opportunity to listen to live bands at the Newton Country Cool Festival. Photo by Jennifer Jean Miller. 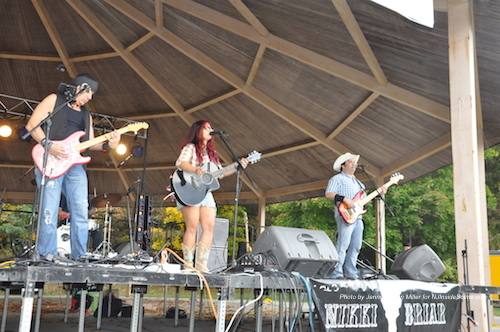 Female Country Music Sensation Nikki Briar and the SweetBriar Band was the headlining act, performing under Sussex County Community College’s pavilion. Other acts included: R.E.N.O. with Tony from the Snake Oil Willie Band, and Mike Herz. Tony from Snake Oil Willie performing the band’s song, “I Don’t Look Good Naked Anymore,” with R.E.N.O. Photo by Jennifer Jean Miller. R.E.N.O. asks members of the audience to rise for a toast for those who serve, including those in emergency services and the military. Photo by Jennifer Jean Miller. 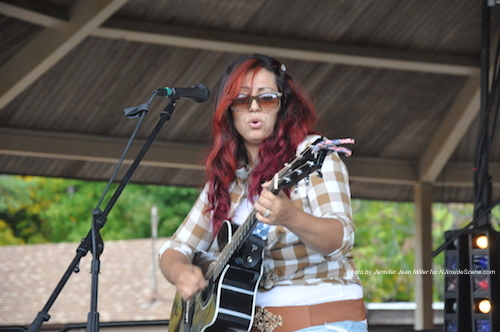 Nikki Briar jams on the guitar with the SweetBriar Band. Photo by Jennifer Jean Miller. 102.3 WSUS was present throughout the day with a live broadcast. Those who attended the event were also asked to bring a canned food donation for the Stuff the Bus campaign, which takes place every fall throughout the county, prior to Thanksgiving. The bus was filling up with food midway through the event, with donations stacking outside of the entrance. “Everybody’s having a nice time today,” said Thomas S. Russo, Jr., Newton’s Town Manager. Russo said he received feedback that attendees were impressed with the effort, with it the first time for the festival. “The vendors are doing great, and everyone is enjoying the food,” Russo added. The weather held out for most of the event, with occasional sprinkles falling, and the clouds breaking in and out, making way for some bursts of sunshine. Groups such as the Newton First Aid Squad, Newton Pride Foundation, the Newton Fire Department and the Town of Newton had tables at the event. There were a number of food vendors including Dre’s, Savour, the Springhouse Creamery, Cliff’s Ice Cream, the Spring Street Pub & Grill, Piggy’s Deli, Hayek’s Market, and Dominick’s. The Newton Fire Department ran two tents, one selling beer and wine and the other soda and water. A few businesses present were: Macaroni Kid, Body & Sole Massage, Thirty-One, Vintage Hip Décor, Fit to Be Tie Dyed, Bagel Bistro, Quilts and Things, Queen Bee Apiaries, Windy Brow Orchards, and Scottish Lily Jewelry. 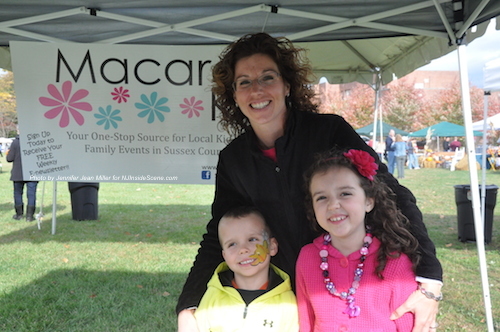 Local Macaroni Kid Editor & Publisher Jaime Boffa poses with two youngsters who enjoyed crafts at her table, and the festival, Nicholas and Ashley. Photo by Jennifer Jean Miller. There was a Kid Zone area with a bounce house, face painting, and pumpkin painting and a pie-eating contest was also scheduled. The Sussex County Social Services Food Pantry assists between 700 to 800 residents each month and the Stuff the Bus campaign, which started six years ago, has collected 400,000 pounds of food for distribution to those in need, since its inception. All donations collected are for residents of Sussex County. Items most needed for the food pantry include: meals in a can (Beefaroni, ravioli, chili, etc), tuna, peanut butter and jelly, cereal, macaroni and cheese, spaghetti, tomato sauce, soups, canned fruit, instant potatoes, rice, kid friendly snacks, personal hygiene products (shampoo, toothpaste, etc), and baby food and diapers. Senator Steven Oroho (R-24) and his wife Rita, were two of the volunteers at the event sharing information about the food pantry, and the bags that volunteers prepare for those who frequent it. He said that donations at the event on Saturday were generous, with some bringing bags of groceries that they dropped off at the entrance. 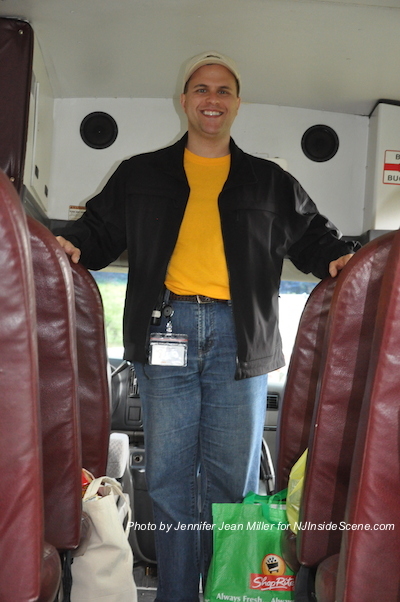 Town of Newton Town Manager Thomas S. Russo, Jr. poses with food items donated at the entryway for the Stuff the Bus Campaign. Photo by Jennifer Jean Miller. 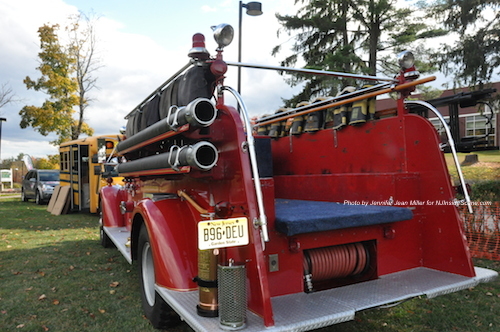 The Newton Fire Museum’s antique Mack engine sits behind the bus for Stuff the Bus. The Newton Fire Museum was also a beneficiary of a portion of the entry proceeds. Photo by Jennifer Jean Miller. 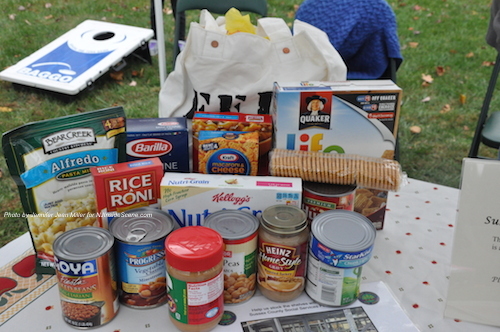 A sample of a bag of food given out to a single beneficiary who receives food from the Sussex County Food Pantry. Photo by Jennifer Jean Miller. “When people know the need they really do give,” said Oroho. Sponsors for the event included: Hampton Rotary Club, Selective Insurance, Lisa Fairclough Enterprises, The Vozza Agency, JCP&L, Thorlabs, Lakeland Bank, McManimon, Scotland & Baumann, LLC, James Alexander Corp., D&E, D&H Alternative Risk Solutions, Laddey, Clark & Ryan, LLP, Ferraioli, Wielkotz, Cerullo & Cuva, P.A., CenturyLink, FMI, and Vogel, Chait, Collins and Schneider. Stay on the scene, with NJ Inside Scene, click here for us on Facebook.